Life After studying at the Lycée Bonaparte, he frequented the workshops of Anne-Louis Girodet Trioson and Antoine-Jean Gros. He installed himself in London in 1822 and returned to France 5 years later. His meetings with Alexandre Dumas, Théophile Gautier, Stendhal, Eugène Sue, Prosper Mérimée, Eugène Scribe, Eugène Delacroix, Louis Boulanger and Honoré de Balzac opened doors to him. Between 1827 and 1832, he produced several albums of lithographs, satirising the mores and physiognomies of his contemporaries and of the “grisettes” (or louche young men) in his office. 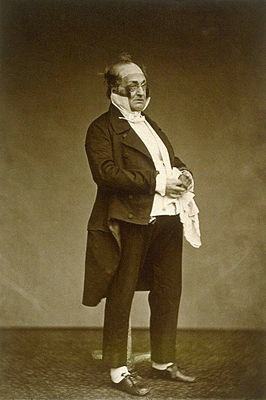 He created the character Monsieur Prudhomme, of whom Balzac said was the “illustration of the type of the Parisian middle-class” and who inspired the poem of that title in Paul Verlaine’s Poèmes saturniens. On 21 May 1834, Monnier married Caroline Péguchet (known as Caroline Linsel, an actress at the Théâtre de la Monnaie) in Brussels. From the 1850s onwards, he essentially devoted himself to writing and theatre. He was the author of the famous phrase – On devrait construire les villes à la campagne, l’air y est tellement plus pur ! – that is usually attributed to Alphonse Allais.